An Excel Filter is an excellent way to quickly analyse data. By selecting one or more variables you can quickly narrow down a huge set of data so that you’re only looking at the entries you’re interested in. To apply filters simply highlight the row of headings at the top of your data and select Data, select Filter and then click on AutoFilter in the resulting menu. Once you’ve done this you’ll find that drop-down arrows appear next to each of your headings. 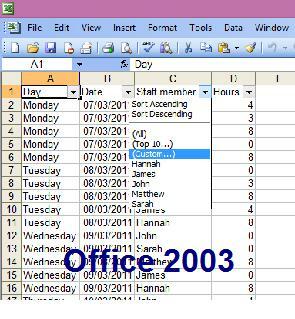 If you’re using Microsoft Excel 2007 or later you can apply filters by selecting the Data tab and clicking on Filter. You’ll notice that the later versions of Office seem to have vastly superior capabilities for filtering in Excel. It’s certainly true that filtering has been made simpler, but very little functionality has actually been added. Returning to our working hours example, the most basic form of Excel filtering would be to view all of the rows relating to a single staff member. To do this simply select the data you want to filter by, in this case we might want to see all of Hannah’s working hours. In Office 2003 or earlier it’s just a case of clicking the option you want in the drop-down list, whereas in Office 2007 or later you’ll need to deselect everything you don’t want to see and then click on ‘OK’. This does take longer, but it also presents you with the advantage of being able to keep as many options selected as you want to see. Once you’ve selected the filter you want to apply, all of the rows which do not fit that filter will be hidden – You’ll be left with only those rows of data which fit your requirements. 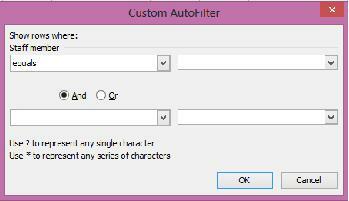 If you need to apply a broader or more specific filter you’ll need to select the ‘Custom’ option. 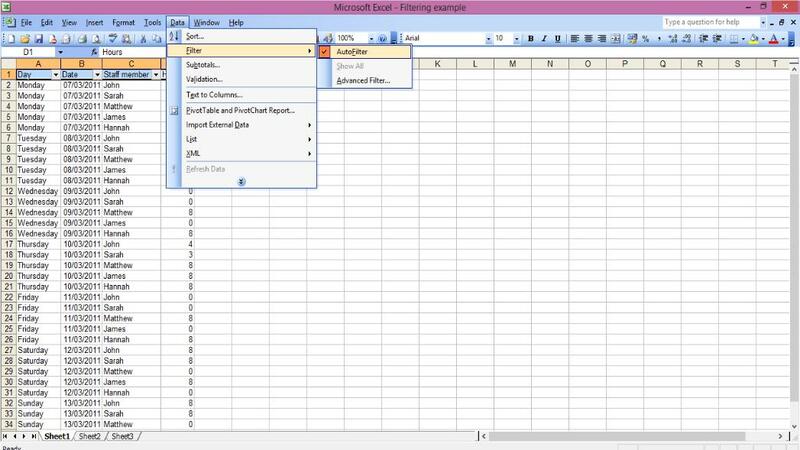 This will enable you to provide Excel with a wider variety of requirements to use in the filtering process. One useful addition to the later versions of Excel is that they can automatically detect whether a column contains text or numbers and offer filtering options accordingly in a sub menu which will either be titled ‘Text filters’ or ‘Number filters’. Some of the custom filtering options available have been provided in these sub menus, but if you want to apply multiple filters to the same column you’ll still need to select ‘Customer Filter’. In the right hand boxes you can either enter values manually or select an option using the drop-down arrows. The values available will be the same as those found in the original filtering drop-down list, so in the case of our example we’d find a list of employee names. Essentially all that needs to be done is to select an argument and enter a value; The combination of these 2 elements will give Excel enough information to provide you with the data you’re looking for. You’ll notice that you also have an option to add a second Excel filter by completing the bottom row in the ‘Advanced filter’ menu. If you wish to use this functionality you’ll also need to select either the ‘And’ or ‘Or’ Arial button. By selecting ‘And’ you’ll be telling Excel that you want to search for data rows that meet both of the criteria you’ve entered, whereas by selecting ‘Or’ you’ll be asking for data rows that meet either criteria. Returning to our example for one final time, we can see one possible way to use an advanced filter like this. The first criteria was simple, our data contains all data rows which contain the name ‘James’. The second set of criteria has returned all data rows which include names that contain the letters ‘ah’ – In this case those names are ‘Sarah’ and ‘Hannah’. Any data rows which don’t fit with either set of criteria have been hidden, so we’re only seeing the data we’re interested in. If desired you can apply Excel filters to multiple columns at once – This is done in exactly the same way as described above. Once you’ve applied your desired filters to a column, you can simply progress to another column and apply further filters. 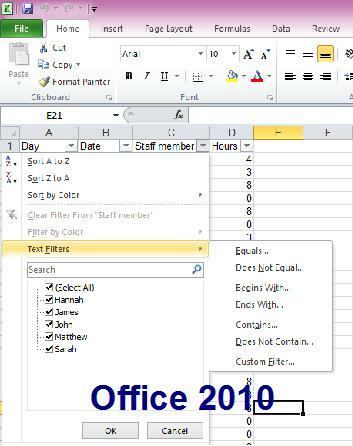 In order to unhide the hidden rows and return to a full data set, just click on the drop-down filtering arrow once again and select ‘All’ in Office 2003 or earlier, or in later versions select ‘Clear filter’. You will need to do this for each column that you’ve applied filters to if you want to return to the full data set. 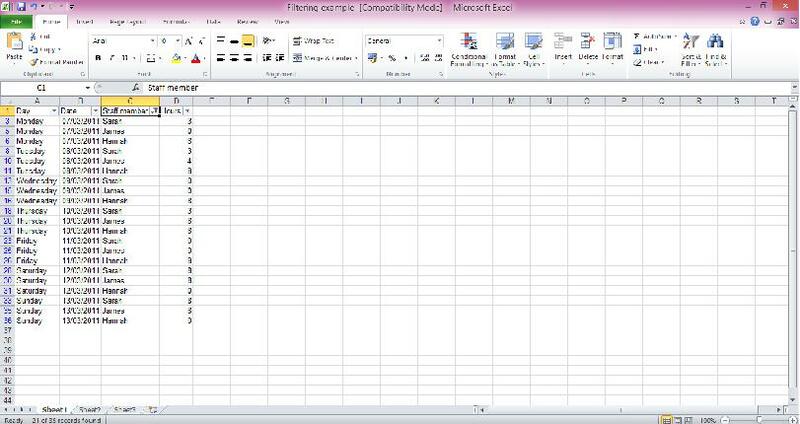 So that’s all for this Excel Filters Tutorial, I hope you’ve found it helpful. Please let me know your thoughts by completing the feedback form at the bottom of the page.